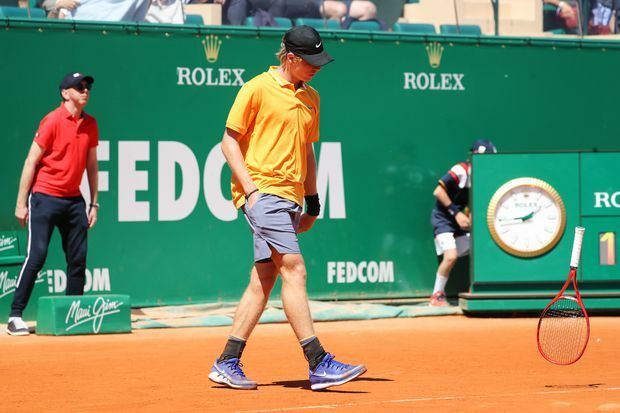 Denis Shapovalov throws his racket on the court after missing a point against Germany's Jan-Lennard Struff during their match on day 3 of the Monte-Carlo ATP Masters Series tournament on April 15, 2019, in Monaco. Denis Shapovalov’s clay-court campaign got off to a poor start as the Canadian lost 5-7, 6-3, 6-1 to Jan-Lennard Struff in the first round of the Monte-Carlo Masters on Monday. The 20-year-old from Richmond Hill, Ont., arrived after a good run on hard courts at the Miami Open, where he lost to Roger Federer in the semi-finals. But the Monte Carlo clay got the better of the big-hitting Canadian, seeded 15th. The unseeded German picked his serve apart, converting six of 16 break points. Montreal’s Félix Auger-Aliassime, a wild card, will play his first-round match against Argentine qualifier Juan Ignacio Londero on Tuesday. Like Shapovalov, the 18-year-old Auger-Aliassime made it to the semi-finals in Miami. Struff next faces Grigor Dimitrov of Bulgaria, who lost in the semi-finals to Rafael Nadal last year. Nadal has not played since pulling out of his semi-final against Federer in Indian Wells, Calif., last month because of an injury to his right knee. Nadal said Monday he resumed practice two weeks ago and feels fit. Top-ranked Novak Djokovic faces unseeded Philipp Kohlschreiber in the second round on Tuesday. Djokovic has won eight of the their 10 matches, but Kohlschreiber recently beat him at Indian Wells. Medvedev did not face a break point in a 6-1, 6-1 win against Joao Sousa. Cecchinato, a French Open semi-finalist last year, was leading 4-0 when Damir Dzumhur pulled out.